We looked to the northeast, the sky was black, we heard rumbling and saw jagged lightening. The wind whipped up and everyone at the pool knew we should pack up our things and get the heck out of there. We made our way to the parking lot and the rumbling got louder. 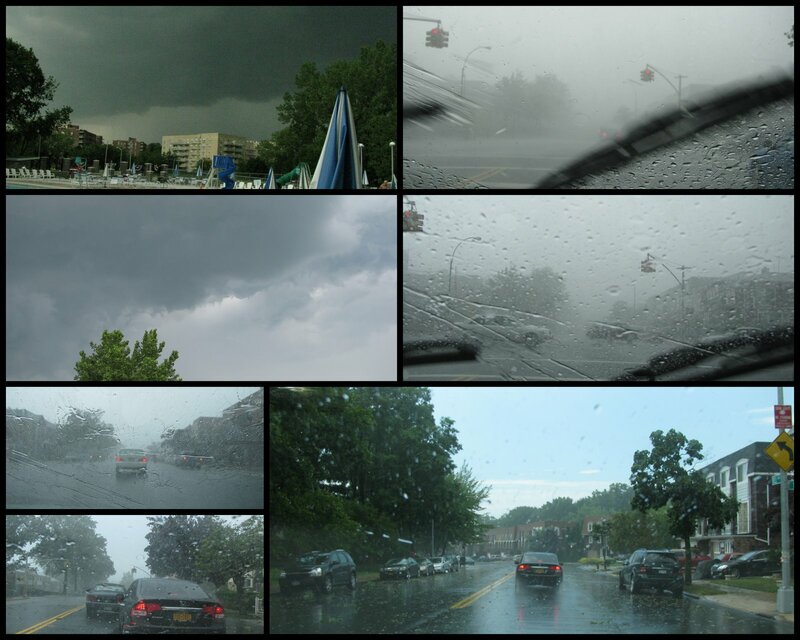 By the time we got into our car and drove a block or two it began to pour, heavy rain along with small balls of hale. Visibility was terrible, the windshield wipers did little. Inside of 10 minutes the sky began to clear, the rain stopped. The roads were wet and covered with leaves and branches, the sky turned bright blue again. These kinds of storms are always amazing - they blindside you and then leave as if nothing whatsoever happened! I love storms like that..they just amaze me! I love storms too, but I'm glad you are ok. I was just watching on tv the destruction in Bridgeport CT.
What a good idea! Reporting the storm in mosaic form! It gives us the idea of something moving-on.....luckily for you! I don't like that at all, it is scary !